If there is one place that has rounded up all our favourite South East Asian flavours and dishes, without a trace of Chindian, then it has to be Misu. Expect dim sum, sushi, nasi goreng and the works. Done up like a trendy Asian bar with tall bar stools, massive glass windows creating the illusion of space, and light club music, Misu, on St Marks Road is like a swish London resto-bar. And it feels like that too. The menu offers salads, starters, small plates, curries and meals in a bowl. The prawn tom yum — spicy and piquant with kaffir lime and galangal, is spot on. If you're here for the drinks too, make sure to order the Orange & Earl Grey Iced Tea mocktail. You can ask for an alcoholic version with vodka too. The Hakka was another surprise with its tropical beach vibes with hints of coconut, lychee juice, passion puree, and lime juice, all shaken with vodka and white wine. 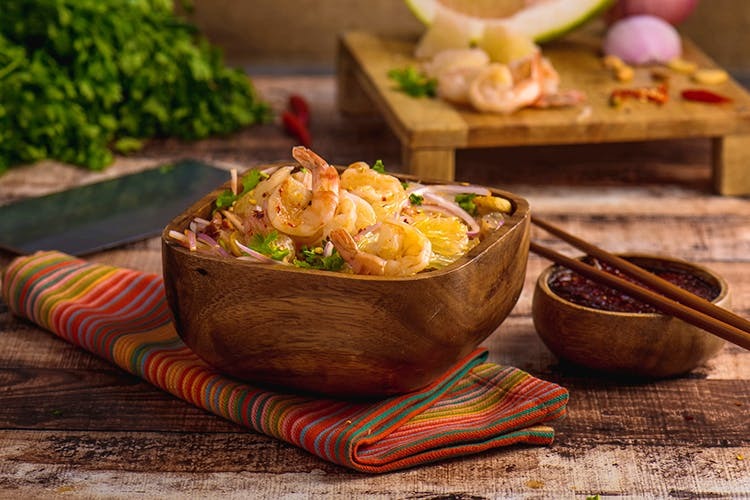 The Spicy Pomelo Salad is for those who love the right mix of tart, sweet and spicy flavours. Up next were an assortment of Rainbow Dumplings (unicorn trend we see you!) stuffed with chicken and basil. The Drunken Beef deserves a special mention, with the right amounts of chilli, basil, garlic and oyster sauce. But we gave our hearts to the Ikan Pepe, even though it was made with basa. While the nasi goreng served as mains was delicious with its fried eggs, chicken satays and spicy rice to be mish-mashed and eaten, our vote definitely goes to the chicken khow suey (vegetarian and mixed seafood versions are also available), served with plenty of condiments. Krapow Chicken, just like how they make in Thailand. Don’t forget to try out the Singapore Style Ice Cream Sandwich. We were pretty sceptical before we bit into it, but one bite and we were converts for life. The delicate Lemongrass Ice Cream complimented the rainbow-hued sponge cake wrapped around it. This dessert made us nostalgic for those ice cream sandwiches of childhood. They have a lovely Ninja Asian meal on weekdays, to cure you from boring meetings. Vegetarians can eat for INR 777 and meat eaters for INR 888.